Heading out this morning to Richmond, VA to pick up Beth. Then we are on our way to Tennessee and the World's Longest Yard Sale. We will be blogging over here for the next few days. We plan on posting lots of pictures and videos of the sale and our big "joint birthday adventure". Sounds fun ! Have a GREAT time !!! So jealous! Can’t wait to hear all about it — thanks for letting us in on the fun! Just read on Beth’s blog that you girls were heading off. I hope you find lots of wonderful treasures. I wanna go too! I am a “Georgia Peach” too and found you in Bella Della’s sidebar! Enjoy that garage sale, can’t wait to see what you find! 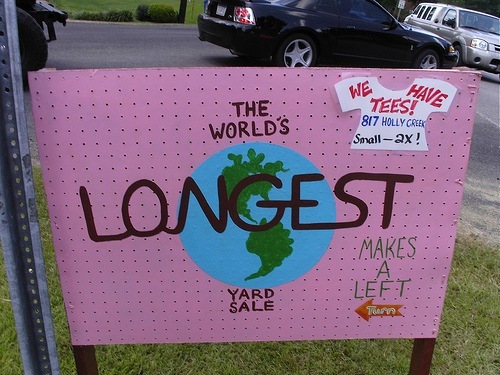 Can’t wait to hear how the longest yard sale was! I want to go someday. I hope you had a blast! Now I’ll head over to your’s and Beth’s other blog to see what treasures you found.